We are obsessed with the predicted 2017 wedding trends! This past month we decided to recreate 4 of the 10 trends and show you are take on them! Our extra wide Tuscan table was the perfect canvas for the greenery inspiration. 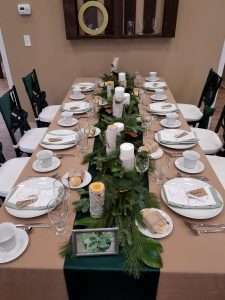 The extra space on the tables gave us the room needed to create a forest inspired table runner with birch pillars and candles. 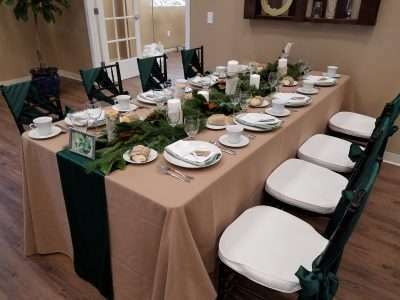 The khaki spun polyester tablecloths give you the earthy vibe and the hunter and sage accents tie everything in nicely. We paired our black chiavari chairs with this display and brighten up the tabletop with our white coupe china. 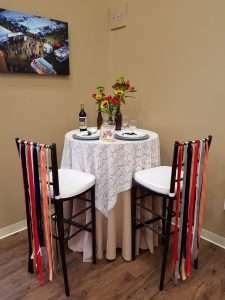 We weaved champagne chair sashes on the back of the gold chiavari chairs for a different yet fancy take on typical chair sashes. Durocher Florist created 3 beautiful arrangements of white hydrangeas with gold glitter sprinkled on top. During these cold winter weeks, this warm neutral theme was a breath of fresh air. 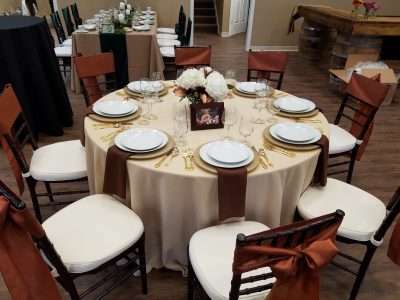 We started off with a tan spun polyester tablecloth and paired them with our deep mahogany chiavari chairs. 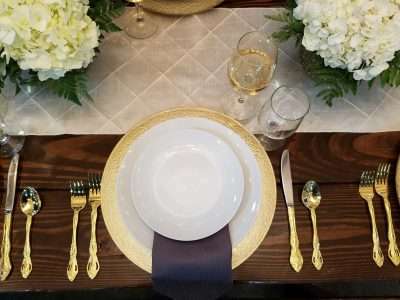 To complement the the mahogany chairs, we used chocolate napkins and gold accents like the charger plates and flatware. 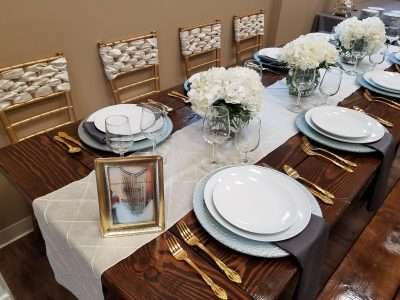 Durocher Florist created the centerpiece for this table as well and even spray painted some greenery copper to match the chair sashes. 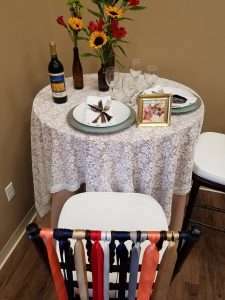 The Boho table was our favorite table to create. We decided to use a cocktail table and our chiavari bar stools instead of a typical 30″ tall table. We tied fun bright ribbons on the back of the bar stools. 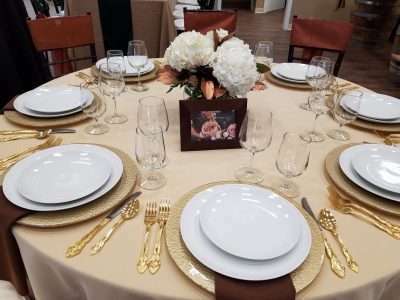 We threw a lace overlay on top of a khaki tablecloth and had Durocher Florist create fun bright centerpieces in miscellaneous brown bottles. Stay tuned to see what we have in store for next months displays!